This newly renovated cottage is 200 years old with mystical charm on its own spacious grounds and is close to Church, Shops, Post Office, Community Centre and Public houses. 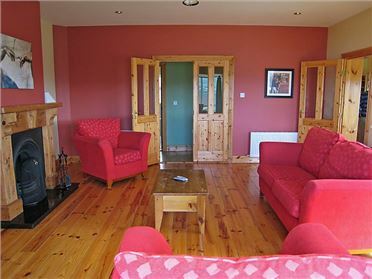 Full of old world charm, the cottage is within easy reach of Charlestown and Knock Airport, (Ireland-West Airport within 10 minutes). The property is idyllically situated within walking distance of the village of Carracastle, which has shop, pubs, church and post office. This charming holiday home offers guests comfortable self catering accommodation in a tranquil setting. The location has been described as the gateway to the West, as counties Mayo, Sligo and Roscommon are all within a four mile radius, all these counties have an abundance of unique attractions for sight seeing and touring. Numerous activities are close by including: golfing, fishing, cycling and nature walks. There is traditional and country and western music in the local pubs at weekends. Rockview House is spacious and decorative, it has three generous bedrooms, one of which is en suite. 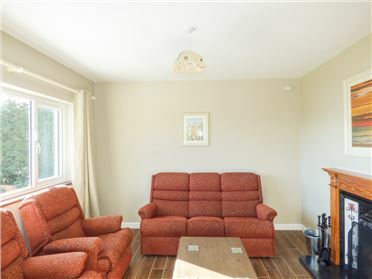 The kitchen and living room are attractive bright and comfortable complete with log fire stove turf/log (turf available). Excellent golfing, fishing, touring base. On the N5, the Cottage is located opposite the sign 'Welcome to County Mayo' on the Mayo/Roscommon road.